Our Large Gun Safes offer you more fire and theft protection than most gun safes. If you would like to store many rifles or many handgun boxes we have a safe that will house your fine collection. 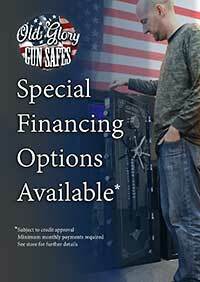 We ship our big oversized gun safes right to your home or office with FREE SHIPPING and NO SALES TAX. Our Large Gun Safes are taller and wider than a man, with more room for the things, you cherish you are not left picking and choosing between what will go into the safe and what won't. Some say it a wise idea to buy a gun safe that is a bit larger than what you will need due to the logistics of moving such a large item considering the labor costs and time involved. Moving such large items can be easy for some people others find it simply out of the question that's where we make things easy for your gun safe installation by contracting an indoor delivery and placing the gun safe right where you want it. Old Glory Gun Safes has a national network of superior safe movers that will put your gun safe in any room of your home or office provided it's on the first floor and no flights of steps in some cases additional service can be provided.